Could the photograph be asking, How little do my countrymen know of each other? Trachtenberg points out that the picture plays the monuments patriotism against the street, where real-life patriots sprawl on the steps. 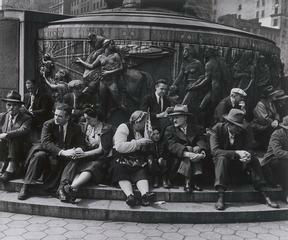 Pictures like this one place Jerome Liebling in the tradition of social documentary photography. The picture goes beyond showing what the camera sees. A social document comments on society, and in doing so, reveals the photographers point of view.